Posted on Sun, Feb 12, 2012 : 6:05 p.m.
Michigan senior guard Zack Novak had 12 points, seven rebounds and three assists against Illinois. Nearly a month had passed since the Michigan basketball team put together two consecutive victories. And now, it's been nearly a year since the Wolverines have lost at home. Tim Hardaway Jr. led four players scoring in double figures Sunday as No. 22 Michigan put together back-to-back victories for the first time since Jan. 11 with a 70-61 win against Illinois at Crisler Center. "The conference this year is brutal," Michigan senior guard Zack Novak said. "To be able to get two in a row for the first time in a while, it feels good. "Hopefully, it's something we can build on." Evan Smotrycz and Tim Hardaway Jr. found both found their shot for the first time in weeks. As a result, the Wolverines have consecutive victories for the first time in a month. Hardaway and Smotrycz, who had combined to shoot 21.4 percent from 3-point range in Michigan's last 10 games, netted 15 and 13 points, respectively, as the Wolverines moved to 14-0 at home . 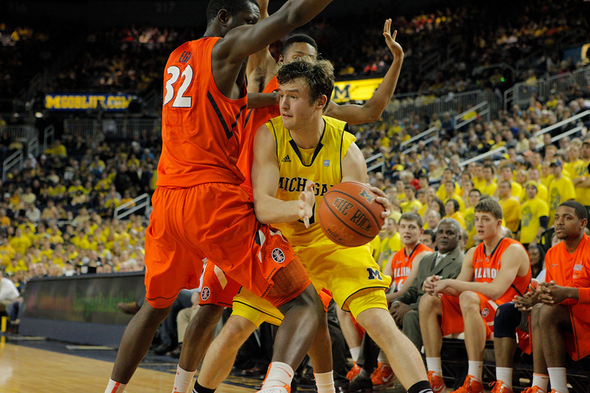 Illinois big man Meyers Leonard was held to one of his worst offensive outputs of the season. Michigan used a combination of Smotrycz, Jordan Morgan and Blake McLimans to hold the 7-foot-1 Leonard, who got in foul trouble midway through the first half, to five points in 27 minutes. His season-low is four. Michigan's off week has arrived. The Wolverines have played at least two games each week since December, but will get six days of rest before playing host to Ohio State on Saturday. After that, the Wolverines will have just four more regular-season games left before the Big Ten Tournament tips on March 8 in Indianapolis. "We needed something good to happen, then all of a sudden Tim hits a shot and Evan hits a shot. And we had been waiting for that, you all had been waiting for that, and we needed that. It was like a shot in the arm." Michigan (19-7, 9-4 Big Ten) is 14-0 at home and the Wolverines are percentage points ahead of Wisconsin for third place in the Big Ten. Michigan is a game behind co-leaders Ohio State and Michigan State with five games remaining. The Wolverines last lost at home on Feb. 23, 2011 — a one-point defeat against Wisconsin. "One of our goals was to just get a streak going," Hardaway said. "It feels good." Hardaway's 15 points came on 5-of-9 shooting, his best shooting performance since making 53 percent at Purdue last month. He wasn't the only one with a rebound performance. Sophomore Evan Smotrycz came off the bench to score 13 points, all but one coming in the first half. It was just the second time in the last 13 games that Smotrycz scored in double figures. "It was good to see some shots go down, finally," Smotrycz said. "It was definitely good for confidence." Hardaway and Smotrycz went a combined 18-for-84 (21.4 percent) from behind the 3-point line in Michigan's previous 10 games. On Sunday, though, the duo went 4-for-6 and shot a combined 8-for-15. "We needed something good to happen, then all of a sudden Tim hits a shot and Evan hits a shot," Michigan coach John Beilein said. "And we had been waiting for that, you all had been waiting for that, and we needed that. "It was like a shot in the arm." The Wolverines put together their most efficient first half of Big Ten play to start, hitting eight consecutive shots at one point before moving in front by nine after a Hardaway triple with 2:36 to go in the half. But, Illinois held pace, getting a late 3-pointer from Tyler Griffey to draw within six to make it 37-31 at the half. Michigan slowly began to pull away early in the second, pushing its lead to 10 after a driving layup from Stu Douglass and going in front by as many as 14 after Novak found Jordan Morgan for a layup to make it 53-39 with 8:50 to play. Illinois was able to cut the lead in half three minutes later after Paul capped a 7-0 surge with a hoop and the foul, and D.J. Richardson's 3-pointer with 1:28 left whittled Michigan's lead down to 62-55. That's as close as the Illini would get, though, as Michigan went 8-for-10 from the foul line during the final 90 seconds. "The ball seems to be flowing better, we're getting easy shots and not taking as many contested ones right now," Novak said. "Teams are going to get better, we've got a freshman point guard, but he's starting to pick things up more. "And we're focusing a bit better now." Freshman point guard Trey Burke finished with 14 points, and Novak added 12 points and nine rebounds. Brandon Paul paced Illinois (16-9, 5-7) with 21 points, while Tyler Griffey added 18. Michigan finished an even 50 percent from the floor, and shot 43.8 percent from 3-point range. The Wolverines were out-rebounded 33-27, but were able to hold Illinois big man Meyers Leonard to five points, one off his season worst. Michigan has a week off before returning to action Saturday for an ESPN "College GameDay" appearance at home against Ohio State (9 p.m., ESPN). The game won't just serve as another chance to showcase the program under a national spotlight, but also an opportunity to avenge a 15-point loss to the Buckeyes last month in Columbus. And, with OSU falling to Michigan State on Saturday, a Michigan win next weekend would firmly put the Wolverines back in the heart of the Big Ten championship discussion. "We'll enjoy this one a little bit," Hardaway said of the Illinois win. "We'll enjoy it today and a little bit tomorrow, but then it's on to Ohio State." Hardaway says the Wolverines will be ready for the Buckeyes on Saturday. And, apparently, so will the home crowd, as the final chant Sunday from a sold out Crisler Center to the Wolverines was a familiar one. Mon, Feb 13, 2012 : 2:20 p.m. This team plays ok defense almost everytime, the problem in the OSU and MSU games were the offense. This team cannot and will not win if they rely on Burke to score all the time for them, Burke, Stu, Zack and Morgan are supposed to be the support guys, the PG, defenders, 3 point specialist and inside operator, the top scorers in this team should be Hardaway and Smotrycz all the time since non conference play. If Hardaway and Smotrycz cannot do their job of scoring heavily, this team will have a hard time winning against good teams like OSU and MSU. This Saturday, if Tim Jr and Smotrycz score , there is as a big chance that OSU will fall, and UM can share the B1G ten title. Mon, Feb 13, 2012 : 3:12 a.m.
Mon, Feb 13, 2012 : 12:50 a.m.
22 free throws on the night. It was nice to see 12 free throws during regular play (not desperation time), and 8 for 10 from the line in the last 1:22 during crunch time was a great sign. Sun, Feb 12, 2012 : 11:27 p.m. When Michigan's offense is clicking and they are hitting their shots, they are a much different team! They have a tall order to beat the Buckeyes because of the match ups inside. The Wolverines need to play their best defense and crash the glass on every shot! GO BLUE! Sun, Feb 12, 2012 : 10:53 p.m.
Sun, Feb 12, 2012 : 9:47 p.m. Completely different team when T.H. and E.S. get hot. Bring on the bucknuts...this thing aint over yet. Sun, Feb 12, 2012 : 10:27 p.m.
We're going to have to learn how to rebound if we want to even come close to winning that one... I say we take it to them in the paint, rack up the fouls on their big guys, then play our game when they're in foul trouble. Otherwise, it's up to our 3 point shooters to keep the game close and hope for the best.